Nolan is officially 10 days old today. The past 10 days have been an absolute whirlwind. We left the hospital on Monday, May 7th. Were readmitted on Tuesday, May 8th into the NICU due to jaundice. His billirubin levels, I'm now realizing, were really quite high for a 3 day old. Like, scary high. 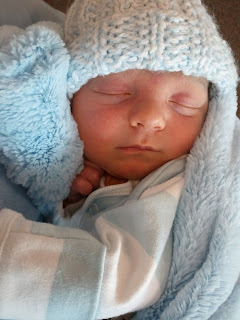 After two days of intense phototherapy we left the hospital and brought home a billi blanket on Wednesday evening. Thursday morning I took him back to the clinic for a retest - counts had gone back up after leaving the hospital. More time on the light. Friday we headed Up North for the weekend to spend some time at the cabin. Saturday morning Collin and I drove back down to Wausau to have his levels checked again. And again they had gone up. Monday morning I brought him back to the doctor and for the first time in a week we finally saw the counts coming down. We decided to try a day off the blanket and see if his body could control the levels on their own. Unfortunately, when we went back today his counts had once again gone up. So we're back on the light for another week. We'll retest again next Tuesday. In the meantime I'm hoping his little heels can heal from all the pokes. I'm exhausted from all the running around and doctor's appointments. I'm overwhelmed by all that needs to be done while I'm on maternity leave. But my heart is bursting with love for this little boy and his brothers. I hope to get back on here with regular updates soon. 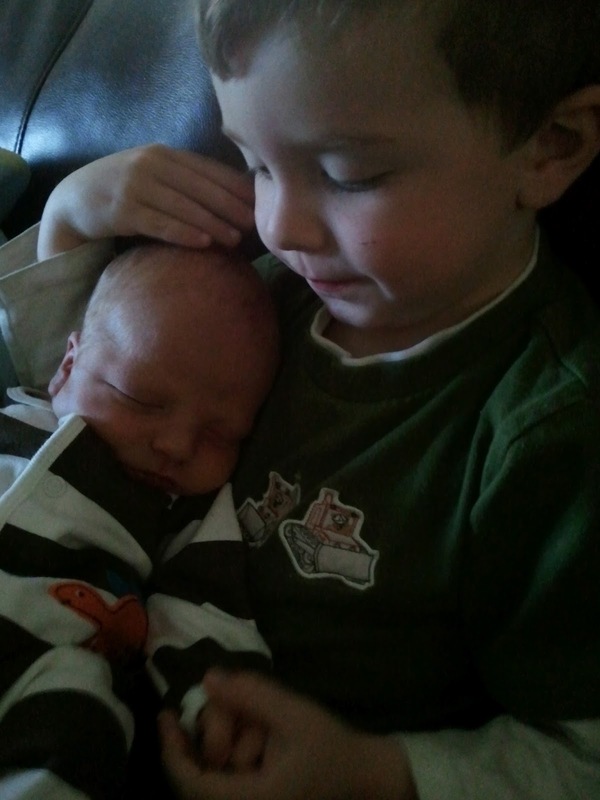 In the meantime, here are a few pictures of our newest little guy. The ones above are from his photo shoot before we left the hospital. The ones below are a few since we've been home. Oh Kate_ I am so sorry for the run around you have had to go through! Ugg- I can just imagine the exhaustion! He is sooooo adorable though and I just can't wait to meet him. Brings me so much joy to see K holding him! Having a newborn is exhausting. Having a preemie is just inhumane! It will get better soon, and you'll look back on it in a year or two and think, "Oh, I hardly remember that." I guess that's a blessing. I hope it gets better really, really soon so you can get some rest now and then and begin to enjoy your new life as a mommy of THREE! WOW! I'm exhausted just reading that. You are a saint for going camping with a 1 week old. LOL. Here's to a week of relaxing and just taking in your boy's. Also, don't freak too much about the blood work issues. We went through it with Brody too. Not as bad but I just remember being so stressed about my milk coming in and him getting enough fluids to flush his system. I look back at his pictures and see he was pretty "yellow" that first week but at the time I didn't see it. His body figured it out and your little guys will do the same. Just one last thing. Looking back at your pictures... I see a lot of Keaton in him. The mouth/chin area and the little stork bite :D He sure is a doll! Welcome to the club of 3, ages 3 and under:) Hugs to you and your family. And PS: I think he looks like Keaton the most. Like I mentioned on FB when I saw some of these pics, I think I just ovulated! Actually, my ovaries feel about ready to burst from all this cuteness. There's been a lot of nudging from me to Drew ever since Nolan's birth to have another...he is standing firm on "No way". But OMG, you are making me want a third SO BADLY. What a beautiful, beautiful family you have, hon.